According to numbers provided by the German AG Energiebilanzen [AGEB e.V. ], renewable energy based electricity generation almost reached the 30% mark in 2016. That made Renewables the most important energy source in Germany for three years in a row. Renewable energy generation rose only slightly last year [+187,4 TWh]. Below average wind and sunshine led to a decline in power production from wind farms and PV installations. Wind was the leading clean energy source at 12.3%, followed by biomass at 7.9% and solar PV at 5.9%. Because of falling natural gas prices, power production from gas rose by 26%. Nuclear and coal-fired power production declined slightly in 2016. The expansion of renewable energy in Germany is a success story and the use of green electricity is increasingly important to private consumers. The Renewable Energies Agency published state-level data and reports that 16-28% of private households have already chosen a green electricity supplier. Front-runners in green power purchasing are people in Berlin [28%], Saarland [28%] and Mecklenburg-Vorpommern [27%], the states of Thuringia and Saxony are the bottom of the league with only 16%. The German average is 22%. 2014 marks a historic milestone in the German energy transition. Renewables became the leading source in electricity generation and hit a record with 27% of the country’s electricity demand. 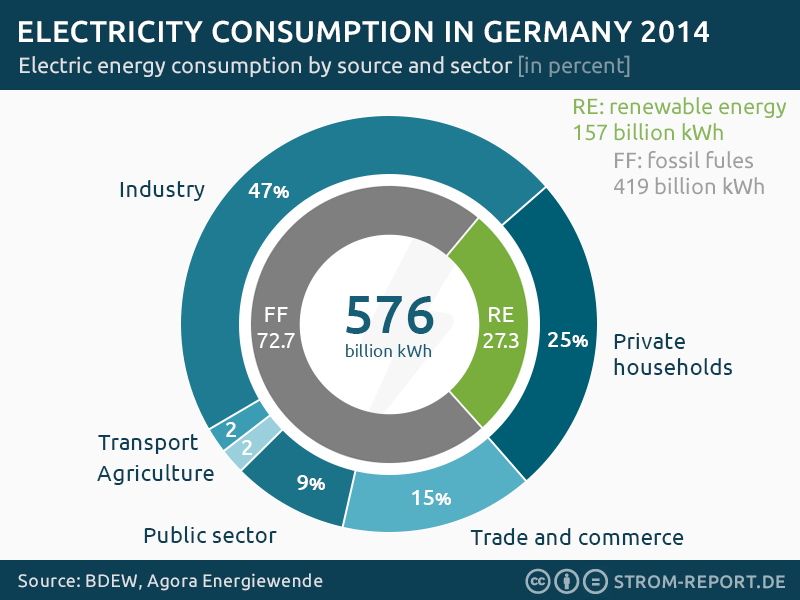 Since the introduction of the Renewable Energy Sources Act (EEG) in 2000, the green power share in electricity consumption has already more than quadrupled [6% - 27%] and if the expansion plan is followed, renewables should cover at least 40% of Germanys electricity demand by 2025. Last year the German electricity consumption decreased by 3.8% to a total of 576 billion kilowatt hours [bn kWh] with a 25% share of private households [144 bn kWh]. Being the second largest consumer group following the industry [47% share], they were able to reduce the demand by 8% over the last year. In 2014 renewable energy sources generated more electricity [157 bn kWh] than German private households demanded [144 bn kWh]. A powerplant in your neighborhood? 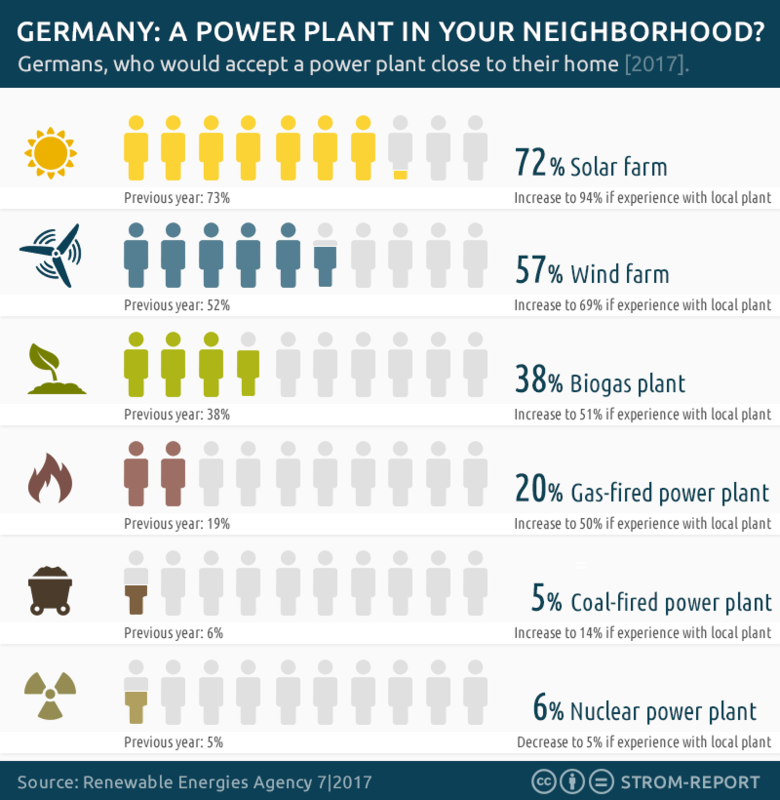 Survey of public opinion: Germans, who would accept a power plant close to their home. According to a 2017 survey conducted by Kantar Emnid for the German Renewable Energies Agency among 1016 respondents, 95 percent of the Germans support further expanding renewable energy. Almost two-thirds of the interviewees agree to renewable power plants close to their homes. The support increases further if respondents already had experience with such plants in their neighborhood. With solar farms it increases from 72 to 94%, with wind power from 57 to 69% and with biogas from 39 to 56%. The acceptance of fossil-fired and nuclear power plants is significantly lower. But even with fossil fuels, the number of advocates increases with the experience. For gas-fired power plants the acceptance increases from 20 to 50% and with coal from 5 to 14%. On the other hand, if the respondents had previous experience with nuclear power, the agreement decreases from 6 to 5%. The most important advantages of renewable energies are seen in their contribution to a secure future [:75%] and protection of the climate [:72%]. For the yearly representative survey, Kantar Emnid polled 1,016 people. From 6 to 26 percent in 20 years time is a decent growth for the renewable energy sector. In 2014 renewables became the leading source in electricity generation. Germany is now one of the top five countries in terms of capacity, production and investments. 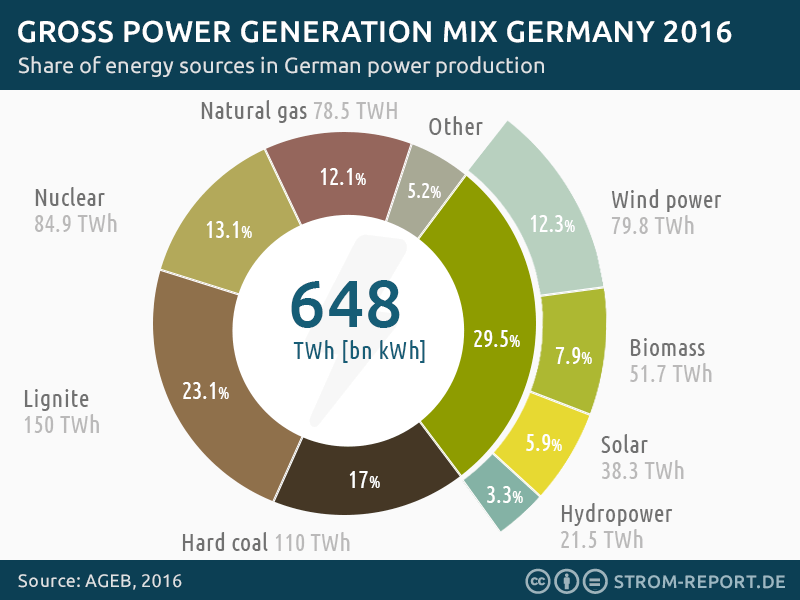 If the expansion plan is followed, renewables should cover at least 40% of Germanys electricity demand in 10 years time. So much has happened since '95: The young technologies succeeded. Wind power, biomass and photovoltaic have gained in importance. Together they generated 126 billion kilowatt hours last year. This is equivalent to the electricity consumption of 36 million households (3 people = 3,500 kWh). The federal states with the highest share of renewable energy in electricity consumption are Brandenburg (76%) followed closely by Schleswig-Holstein (66%) and Mecklenburg-Vorpommern (62%). This ranking is determined by the German Solar Energy Society. Germany’s energy transition, or Energiewende as it is also known, is a long-term plan to cut carbon emissions by replacing fossil fuel resources with renewable energy sources. 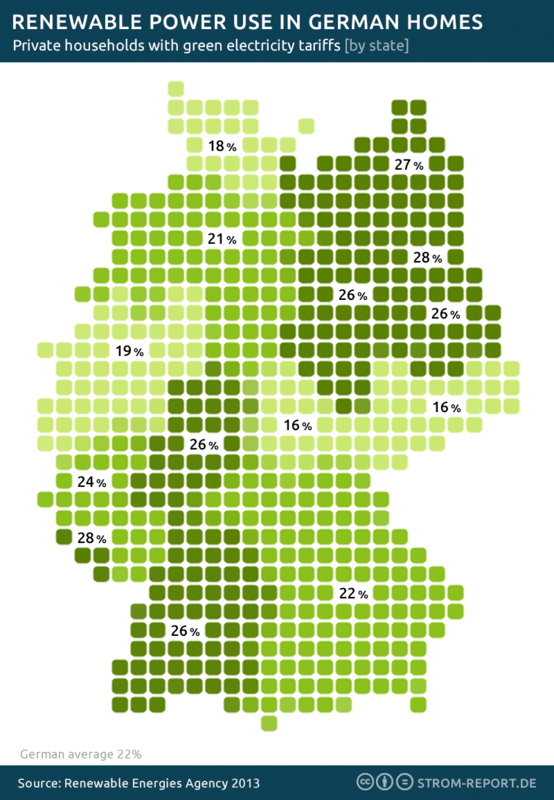 But how popular is the ambitious green energy plan among Germans? The Agency for Renewable Energies did a survey on acceptance of renewable energy and found out that a majority of 92 percent will support an increasing development and use of alternative sources. According to a survey conducted by the consulting company PricewaterhouseCoopers, 65% of Germans can imagine to produce their own green electricity. With 44.947 MW, Germany has the most wind power capacity [32%] installed in Europe and was the leader in new installations [47%] 2015. Last year 26.772 wind turbines on-and offshore generated 13.3% of the electricity in the country. Wind made the largest contribution to generating electricity from renewable energy sources with 86 terawatt hours total and it is also the largest employer among the renewables with 149.200 jobs. In a worldwide comparison, Germany comes in third with 10% of the installed capacity, right behind China [34%] and the United States [17%]. Wind energy was the strongest investment division 2015, which reached 66.5% [€9.7 billion] of the entire renewable investment volume of €14.5 billion. Although 2015 recorded the second highest investment volume to date, investments decreased by 20% compared to the record year 2014 [€12.1 billion]. €5.2 billion were invested in onshore wind power, the investment volume offshore added up to €4.5 billion. The new installation of wind turbines increased by 10% compared to the prior year. 1,115 wind turbines with a maximum total capacity of 3536 MW were installed on the mainland in 2015. Offshore 546 units with a peak power of 2,283 MW were connected to the grid. 35% of all installed onshore wind turbines in Germany can be found in wind farms in the two strongest developing states Lower Saxony [8.602 MW] and Schleswig-Holstein [5.896 MW]. For the third year in a row, Schleswig-Holstein is with 23.8% the leader in the State comparison regarding the gross changes, followed by North Rhine-Westphalia [11.3%] and Lower Saxony [11.1%]. Wind technology has developed greatly in recent years. The trend toward larger and more powerful wind turbines continues. Since the turn of the Millennium, the 2 to 3 megawatt class dominates the market, but the importance of the 3 to 5-megawatt class is increasing significantly. 2015 the power of a newly installed wind turbine on land averaged 2,727 kW. That's 144% more than in the year 2000 [1,115 kW]. Today the average rotor diameter of a turbine is with 105 m 81% higher than in the year 2000 [58 m]. The hub height also increased by 73% [71 m] to 123 meters. Offshore, the average power of the newly installed units was 4.145 kW. The rotor diameter is just below 120 m and the hub height 89 m.
The German wind energy industry is booming, creating thousands of jobs. 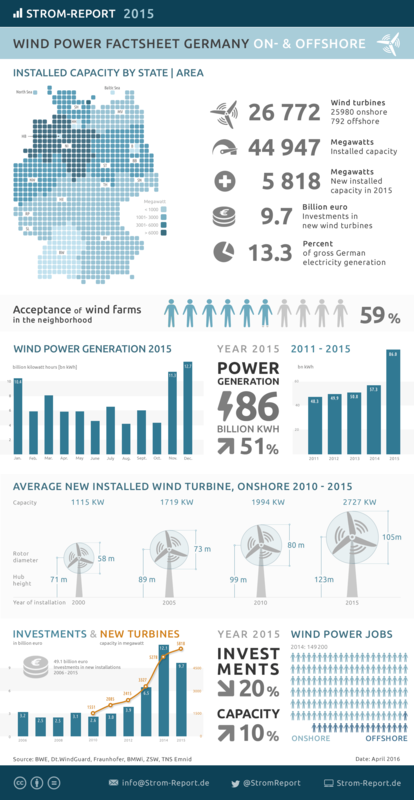 In 2014, 149.200 people in Germany were working in the wind industry - 130.500 of them worked onshore and 18.700 offshore. The employment has increased by 8% compared to the previous year. With a share of 42%, the wind energy industry is the largest employer among the renewable energies [355.400 jobs total] and the only one that increased in 2014. 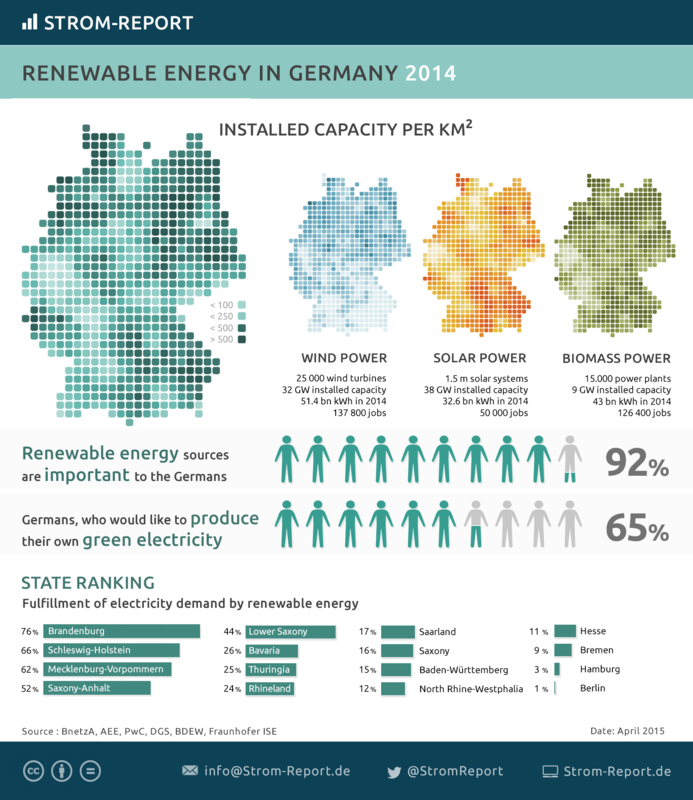 The German population is strongly supporting the energy transformation. According to a representative survey by TNS Emnid on behalf of the Renewable Energy Agency [AEE], 93% of the respondents find the further expansion of renewable energy important. Inter-generational equity and climate protection are the priorities according to the respondents. 59% of the respondents would accept wind turbines in their own living environment. The agreement increases to 72% if the respondents already have experience with wind farms in their neighborhood. According to the survey results, fossil fuels are less accepted by the consumers. Only 7% of the respondents said they would be comfortable with a coal power plant in their own neighborhood. The German electricity system has reached a new milestone, generating 85.4 bn kWh of wind power in 2015, which is the highest amount ever recorded and 66% more than 2014. Nationwide, wind energy accounted for 13.3% of German electricity generation during the last year. According to grid operators storm „Bjarni“ set a new output record of 32.6 m kW at the end of the year. 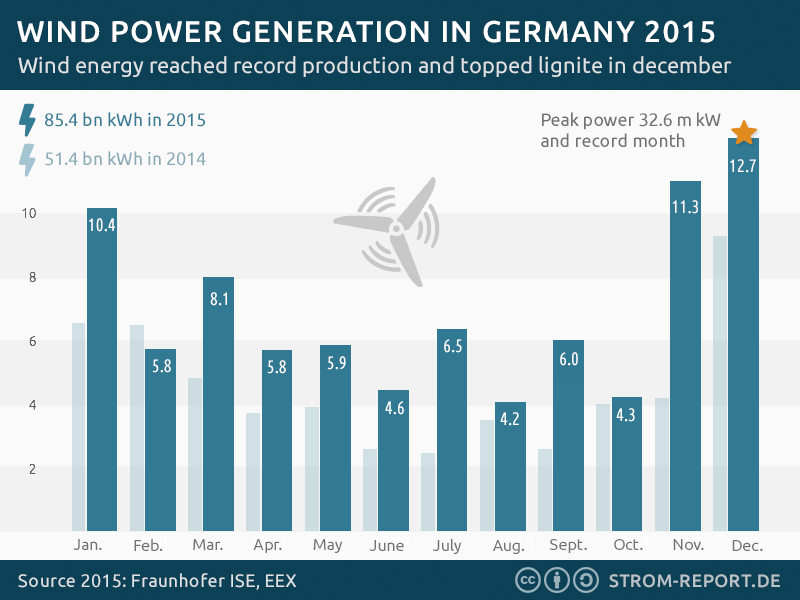 Consequently wind power saw its best month ever in December 2015. With an electricity generation of 12.7 bn kWh it achieved a new record and was even ahead of lignite production which made wind Germany's most important sources of energy for that month. About 1.5 million photovoltaic systems with a total capacity of 38 gigawatt (GW) are installed in Germany, ranging from small rooftop systems to large solar parks. In 2014 Photovoltaics produced approximately 6.9 percent of Germany’s net electricity consumption. On sunny days, solar power can cover 35 up to 50 percent of the momentary electricity demand. Almost half of the capacity is installed in the southern states Bavaria (11.1 GW) and Baden-Württemberg (5.1 GW) followed by North Rhine-Westphalia (4.2 GW). 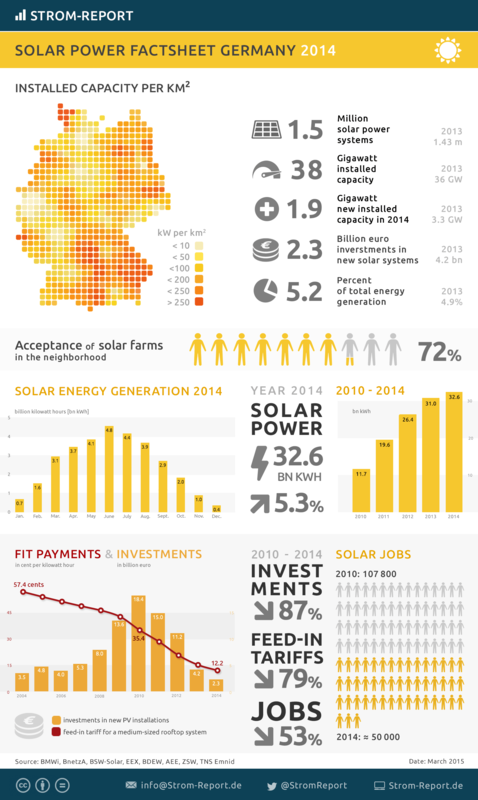 2.3 billion Euro have been invested in new photovoltaic installations in Germany in 2014. This is a decline of almost 2 billion compared to 2013 and a drop by 87 percent since the record year of 2010. As the German Renewable Energy Sources Act (EEG) guaranteed a fixed feed-in payment it provided sustained planning security for investors in PV systems. The feed-in tariff is set for a 20- year term at regular intervals. The subsidy is covered through a surcharge on consumer electricity bills. The government has provided - and afterwards cut - the incentives for renewables. As a result the amount of new installations declined significantly due to restrictive governmental policies. The 0.57 € feed-in tariff for medium-sized rooftop systems, that was paid in 2004, has fallen to around 0.12 € per kWh today. 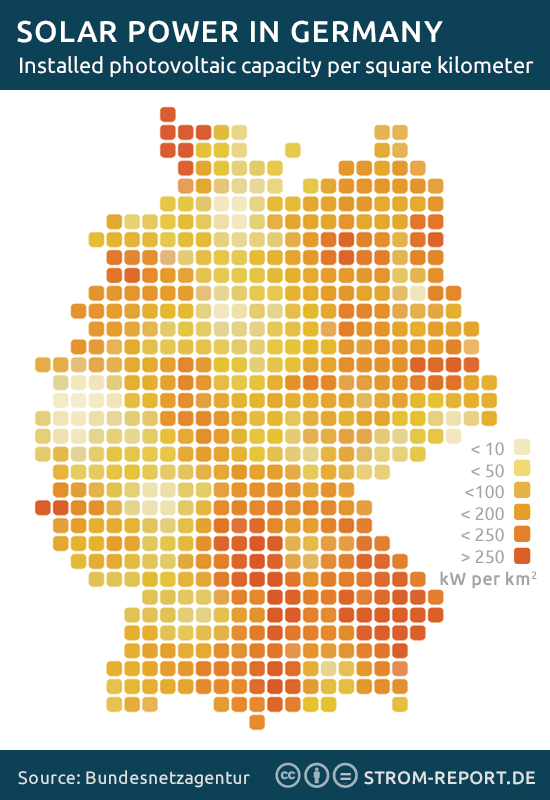 Germany is the most developed PV market with an installed capacity of 38.2 gigawatts. 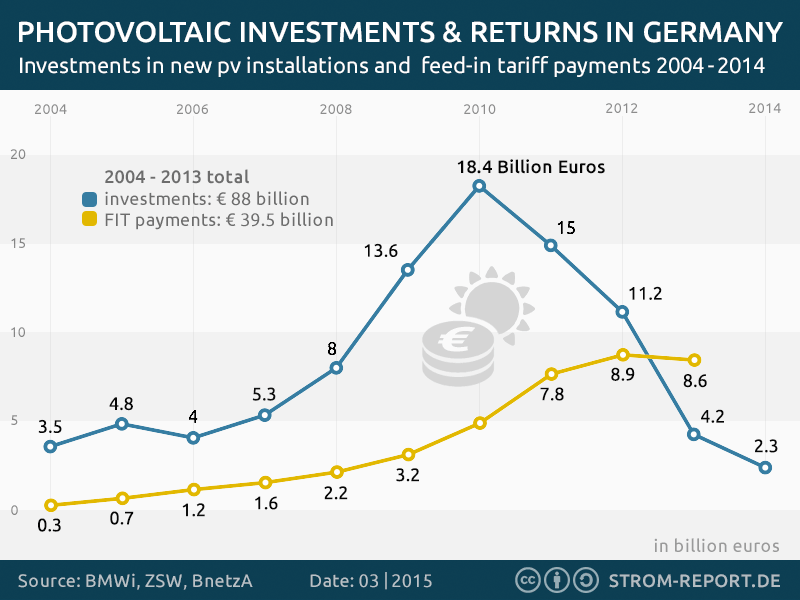 2.3 billion Euros have been invested in new photovoltaic installations in Germany in 2014. This is a decline of almost 2 billion compared to 2013 and a drop by 87 percent since the record year of 2010. As the German Renewable Energy Sources Act (EEG) guaranteed a fixed payment for solar generated electricity for a duration of 20 years, it provided sustained planning security for investors in PV systems. The government has provided - and afterwards cut - the incentives for renewables. As a result the amount of new installations declined significantly due to restrictive governmental policies. The 0.45 Euro feed-in-tariff for large photovoltaic systems, that was paid in 2004, has fallen to around 0.08 Euro per kWh today. Total installed PV capacity in Germany grew by 318 megawatts in the first 3 months of 2015. This is a decline of 30 percent compared to 2014. If this trend continues, the annual growth will not exceed 1300 MW, which is far below the government's goal of 2400 MW. About 1.5 million photovoltaic systems with a total capacity of 38,2 gigawatt are installed in Germany, ranging from small rooftop systems to large solar parks. Photovoltaics produced 5.2 percent of the country's net-electricity generation in 2014. Almost half of the capacity is installed in the southern states Bavaria (11.1 GW) and Baden-Württemberg (5.1 GW) followed by North Rhine-Westphalia (4.2 GW). 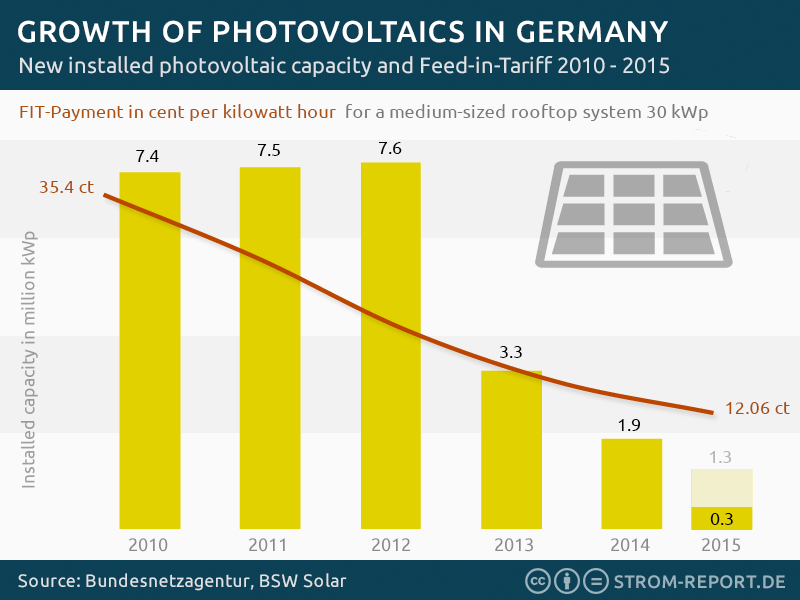 Against all resistance solar power in Germany was breaking records in 2015. With 36.8 billion kilowatt hours, photovoltaics actually generated 5.4% more solar energy than the year before. Sunny weather in April boosts solar power generation, providing a peak power output of 25.8 million kW at midday on April 21, 2015. 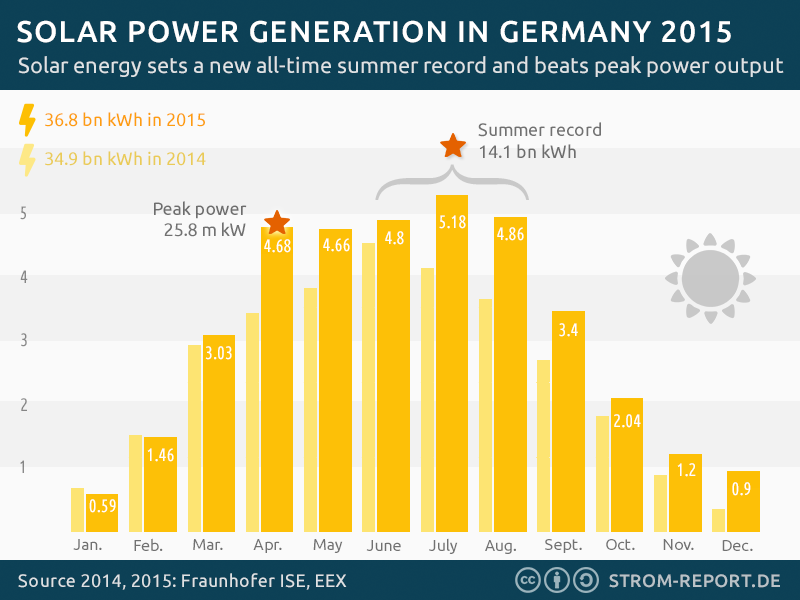 German photovoltaic systems just broke its summer solar power generation record once again. From June to August, the electricity system logged 14.1 billion kWh from solar power, 7.2% more than 2014. On July 25 green energy set a new national record by meeting 78% of the day’s electricity demand with renewables sources, according to an analysis by energy expert Craig Morris [German Energy Transition]. A stormy day in northern Europe combined with sunny conditions in the south led to the new record. Solar capacity growth in Germany has fallen every year since 2012 but in terms of total solar power per capita, Germany is still number 2 in the world. Liechtenstein nowleads the ranking [CleanTechnica], with Germany close behind and Italy on the third place. At the end of 2015, Germany had 487 Watt of solar power capacity per person. [39.6 bn kWh/ 81.3 m residents]. 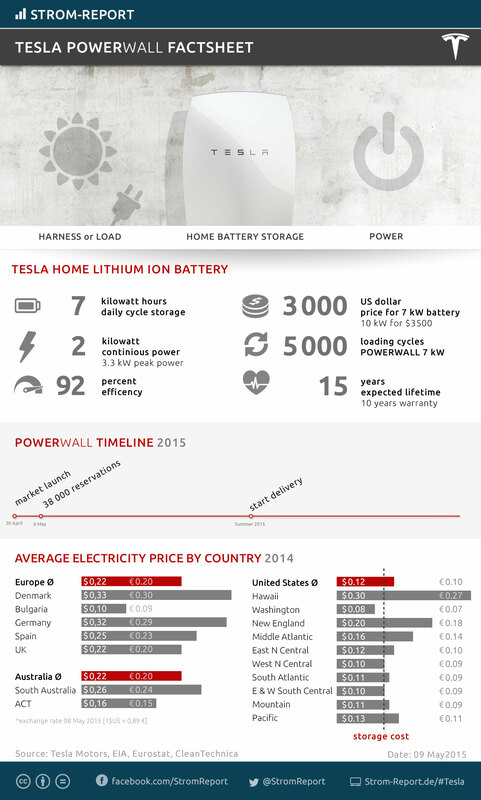 It's been a week since Tesla unveiled its Powerwall battery system for homes and businesses. It's a 110-kilogramm flat battery pack in an aesthetic design that can be installed on a wall - indoors or outdoors. Elon Musk - CEO and product architect of Tesla Motors - announced the Powerwall storage system at $3,000 for the 7 kilowatt hour (kWh) battery and $3,500 for the 10 kWh model [not including the installation costs]. The Powerwall does two things: It stores solar energy if you have solar panels and it stores energy from the grid when electricity is cheapest. Off-peak-storage is interesting in countries where utilities have time-of-use dynamic pricing. If you’ve already solar panels on your house you can essentially go off the grid. Multiple Powerwalls can be grouped to 90 kWh total for the 10 kWh battery and 63 kWh total for the 7 kWh battery. The battery continuously generates 2.0 kW and 3.3 kW during peak usage. The Powerwall units will be able to be connected to the internet, so owners can access management software and stats and can link their batteries into micro-grids. This means, that Powerwalls can contribute to the ballance of the power grid to support supply and demand. Tesla is making inroads into the energy market with massive promises. After one week on its earnings conference call, Elon Musk mentioned that they already received 38,000 reservations for the home system and 2,500 reservations for the much bigger, commercial-scale battery systems. Analysts at Bloomberg did the maths and estimated that all these reservations are worth approximately $800 million in potential revenue for Tesla, if they convert to sales.This sounds like an overestimate, but a spokeswoman for Tesla said that the numbers "look right“. The Tesla home batteries will initially go on sale in the US in late summer and are already sold out until Mid-2016. 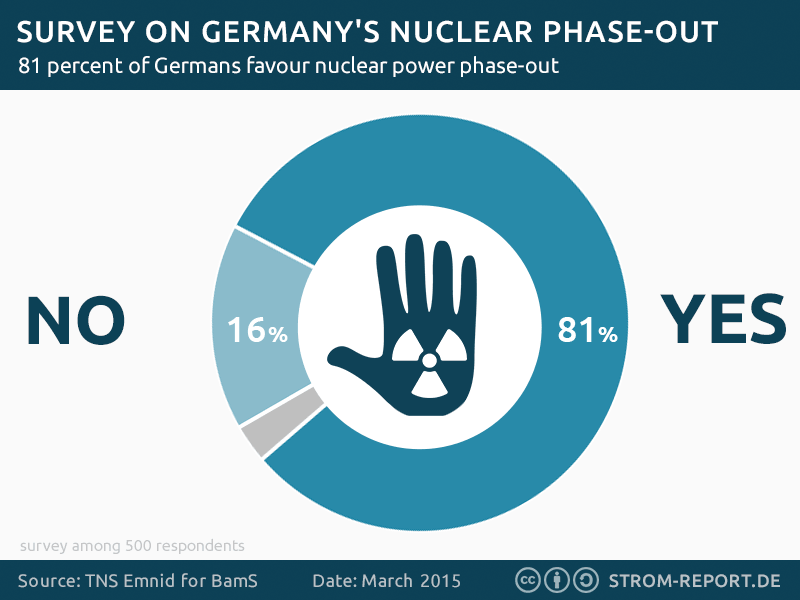 Four years after the nuclear disaster of Fukushima four out of five Germans still favor the nuclear phase-out. Following the March 2011 Fukushima accident, Germany has pledged to close its 17 reactors by the end of 2022. According to a recent survey conducted by TNS Emnid for the German Newspaper „Bild am Sonntag“ among 500 respondents, 81 percent continue to agree to the Energiewende. More than 7.7 million people are employed by the renewable energy industry worldwide, states a new report from the International Renewable Energy Agency [IRENA]. This is an 18% increase from last year’s figure of 6.5 million. In addition, IRENA estimates, that large hydropower supported 1.5 million direct jobs – almost half of them in China. 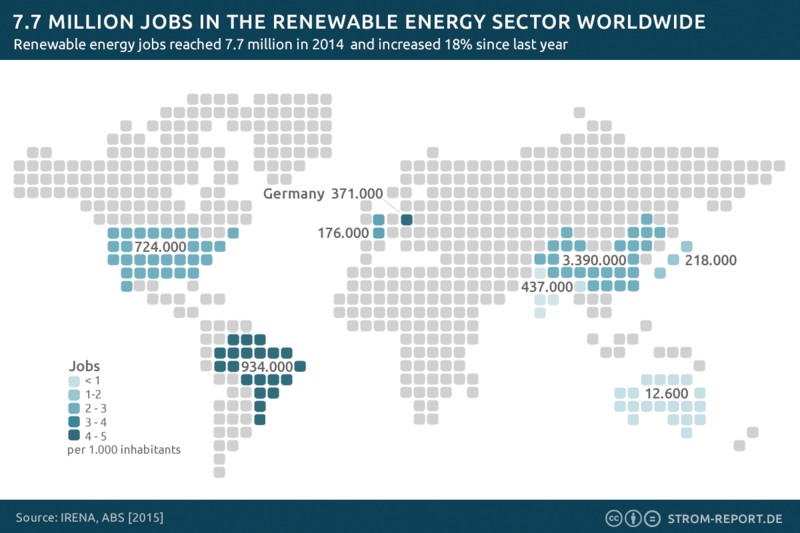 This sums up renewable jobs in the world to more than 9 million last year. The 2014 rise is again led by China, which employs more than two-thirds of the global solar jobs and half of the wind power jobs. Brazil and the United States continue to dominate the biofuels and biomass sector. 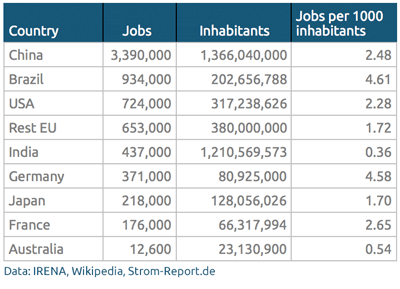 When it comes to job numbers compared to countries population, Brazil leads with 4.6 of 1,000 inhabitants working in the sector followed by Germany [4.58 per mill], the leading renewable energy employer in Europe. In the United States total renewable employment increased by 16% to reach 724,000 jobs in 2014. That means 2.3 of 1,000 Americans are working for the renewables which leads to number 4 in the ranking. It is only slightly less than Chinese employment of 2.5 per mill [third position]. How much does a nuclear accident cost? 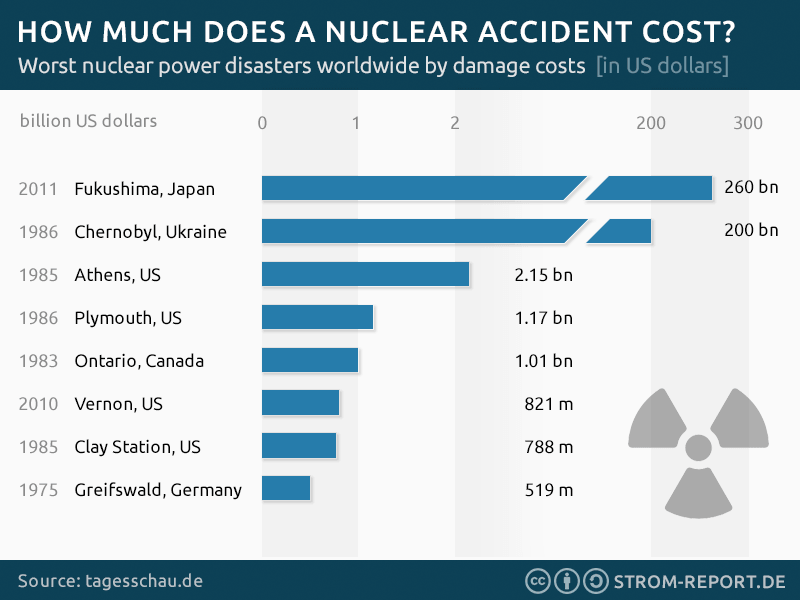 Worst nuclear power disasters worldwide by damage costs. Worldwide, many nuclear accidents have occurred. The worst were the disasters in Chernobyl in 1986 and Fukushima in 2011. The health impact from the release of radioactive material was fatal, the contamination of the environment is long-lasting and the cost to deal with its consequences increased to several hundred billion dollars. The costs for the tragedy at the Fukushima nuclear plant are estimated to be 260 billion US dollars. The Chernobyl accident has approximately cost 200 bn dollars until today. Air pollution harms human health and caused 600,000 premature deaths in 2010. As a World Health Organization study reported yesterday, this leads to an estimated US$ 1.6 trillion loss, which is equivalent to 10 percent of the European Union’s 2013 gross domestic product. 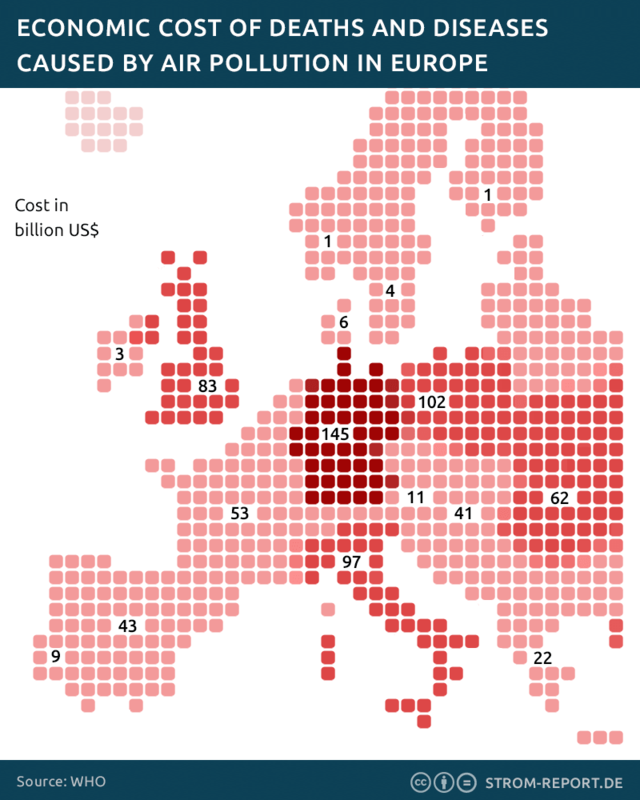 The research covers all 53 Member States of the WHO European Region and assigns an economic value to the air pollution impact on European public health for the first time ever. Many of the air pollutants come from the same sources as greenhouse gas emissions: power plants, heavy industry and road transport. They accounted for 482,000 outdoor and 117,200 indoor early deaths from strokes, heart and respiratory diseases. The mortality rates are five times higher in low-and middle-income countries. The economic value corresponds to the amount countries are willing to pay to avoid these deaths and diseases.